Dubai: it's me! in the UAE! : bloggie. Sony Bloggie: early Christmas present from Mom, Dad and Santa! Coolest little thing. 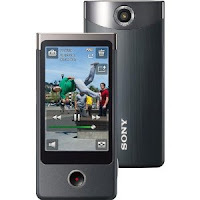 It takes HD quality video, similar to a Flip camera, but can ALSO take still photographs on it. Here's the catch, you can take still photographs WHILE you're videotaping something. Freakin awesome! So hopefully I'll be using this little bloggie thing to post stuff for my blog! So glad you made it - can't wait to hear all the details! I'm sure you are anxious to start studying! So glad you made it there safely! Can't wait to hear about all of your amazing adventures! Hey Maddie - great picture at the restaurant - inquiring minds want to know - have you been skiing yet? We were just at dinner that night. So I have not been skiing yet. But it will happen eventually. For sure. I've made videos but I can't upload them on the internet connection at the dorms. When school starts next week I'll try it with the wireless access there. For now I'll try to upload a few pictures from each day.